I’m always on the hunt for good recipes that use rotisserie or already cooked and shredded chicken. Why? It’s how I use up the chicken that makes my homemade chicken stock. 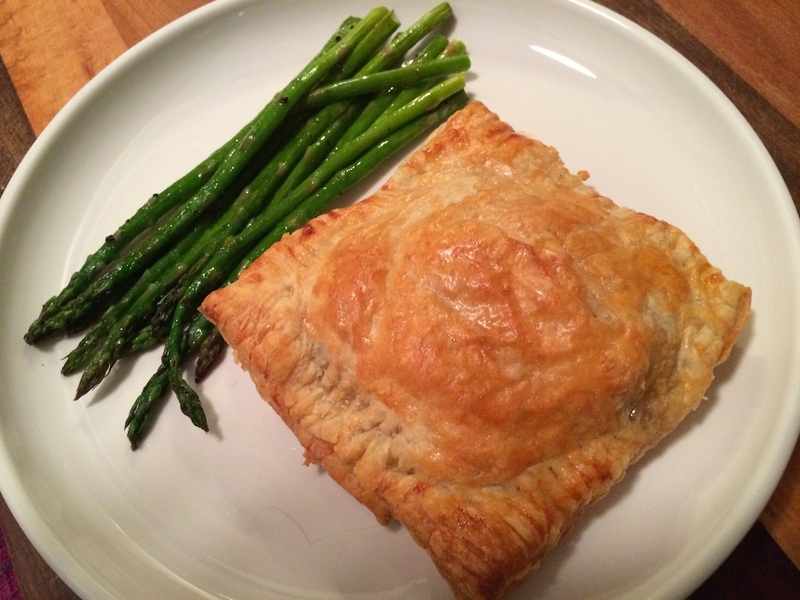 This is a deliciously rich recipe that takes some of my favorites like mushrooms and cheese and packages it all together with some chicken in a puff pastry pouch. No-brainer, right? 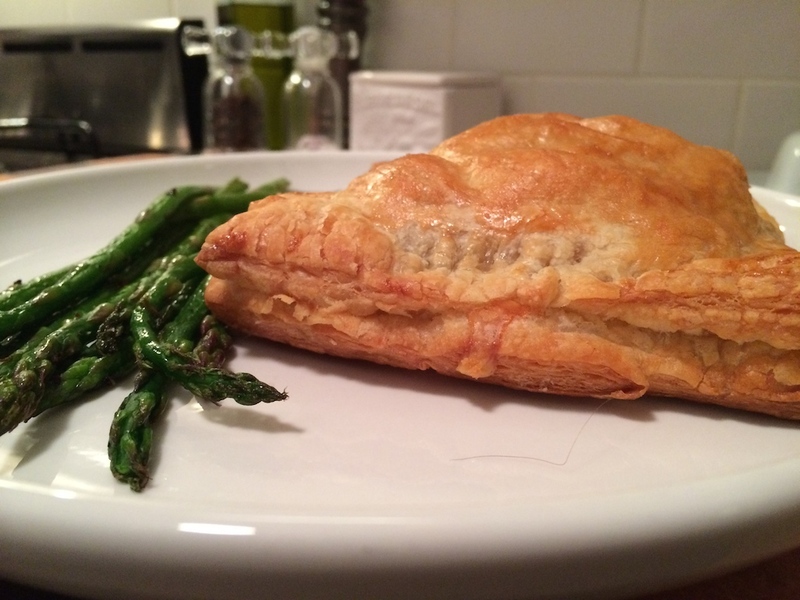 I found this recipe on the Recipe Girl blog. Serve it with a green side and you’ve got a meal! I omitted the bacon in mine (didn’t have it on hand–you know I love bacon. Still delish! Keep an eye on these while they’re in the oven so they don’t get too brown. Preheat the oven to 400 degrees F. Line a large baking sheet with parchment paper. In a medium skillet, cook the bacon until crispy. Remove to paper towels to drain, then crumble. Remove all of the bacon fat from the skillet except for 1 tablespoon. Add the mushrooms and onions to the skillet and saute over medium heat until softened. Stir in cream, Dijon and salt/pepper. Cook until reduced slightly and thickened. Set aside to cool a bit. Assemble the pastries. Cut each sheet of puff pastry into 4 equal squares. Divide the mushroom mixture between 4 squares. Top with turkey, bacon and Swiss cheese. Roll out each of the remaining puff pastry squares so they’re a little bit larger (or just use your fingers to press and stretch them). Place the second piece over the top of each with filling. Use a fork to seal the edges to form “pockets.” Brush each square with egg wash and use a knife to poke a few slits in the top for steam to escape while baking. Bake for 20 minutes, or until golden brown. Serve immediately. 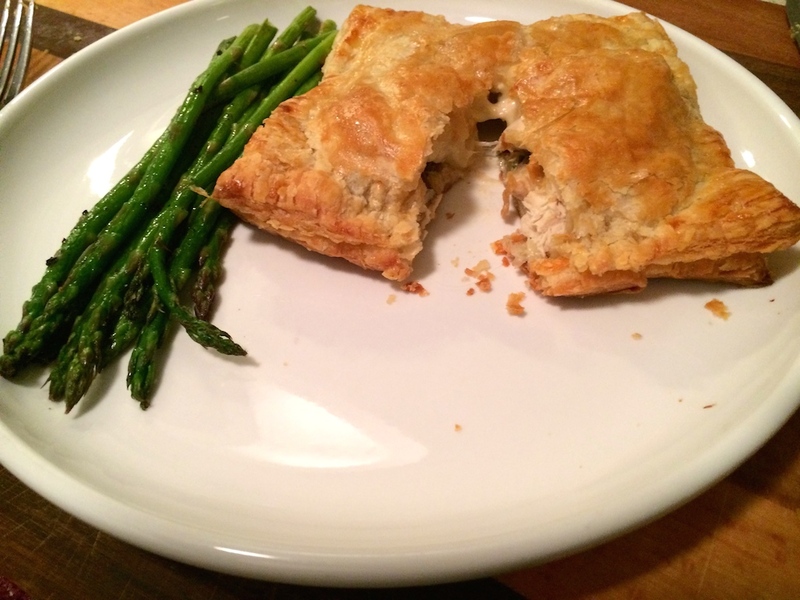 This entry was posted in Recipes and tagged chickent, mushrooms, puff pastry, turkey by Tricia. Bookmark the permalink.